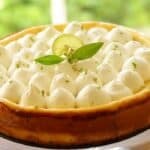 This Key Lime Pie Cheesecake combines two of the best Easter flavors, rich cheesecake and key lime pie, all set upon a chocolate cookie crust! The best part is it can also be made at least 2 days ahead of time! Preheat oven to 350F (176C). Spray a spring form pan with baking spray and distribute well with a pastry brush and set aside. Place the cookies, the sugar and salt in a food processor (This link goes to Amazon where I am compensated for products sold). Process until crumbs form. Add melted butter, continue to process until wet crumbs form. Transfer crumbs to the spring form pan and shake the pan to level the crumbs and then press them tin with a measuring cup or the bottom of a glass. Bake crust for 5-6 minutes until fragrant. Allow to cool. In the bowl of an electric mixer, combine cream cheese and sugar, beat on high until smooth. Add eggs, one at a time, beating in between each addition. Add vanilla extract and beat and then add flour and beat just until combined. Pour cheesecake filling into cooled cookie crust, smoothing out with a spatula until layer is leveled out. Set aside. In a large mixing bowl combine sweetened condensed milk, egg yolks and key lime juice. Whisk until smooth. Pour the key lime mixture on top of the cheesecake mixture, making sure you are covering all the cream cheese with the pie filling. Smooth out with a small spatula. Bake in a 350F(176C) oven for 35-40 minutes until cheesecake is set and jiggles slightly. For whipped cream topping, combine heavy cream, powdered sugar and vanilla in the bowl of an electric mixer. Whip on high until stiff peaks form. Transfer to a pastry bag with a round tip. Pipe little dollops of whipped cream all of over cheesecake until covered. Garnish with fresh lime zest on top and a thinly sliced lime wheel in the center. Chill overnight to set. Resist the urge to just pour the key lime batter directly in the center of the cheesecake. It works better to pour it around the perimeter of the cheesecake and then a little bit in the center. Pat the cookie crumbs down with a measuring cup. This will create a nice tight crust and it’s a bit easier to get uniformity this way, than trying to do it with your hands.